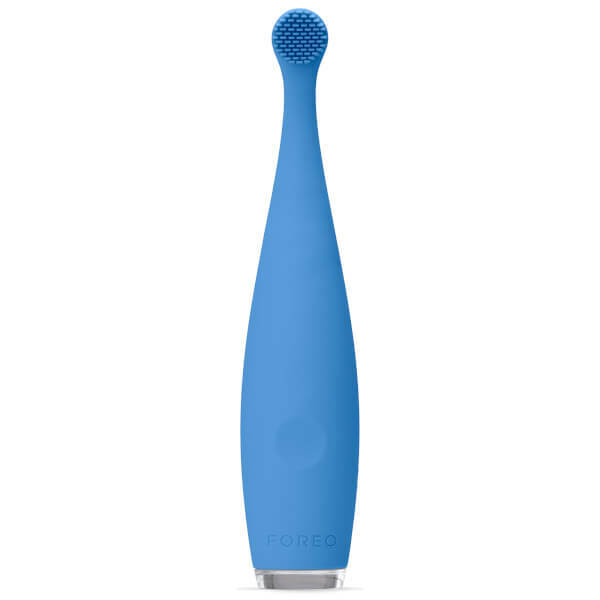 Catering specifically for babies aged 0-4 years, FOREO's ISSA™ mikro Toothbrush allows a safe, fun and healthy brushing routine and promotes stronger, healthier gums. Combining non-abrasive, super-soft silicone bristles with Sonic Pulse Technology, the innovative, colourful device features two modes: a 'Brush' setting to cleanse delicate teeth and gums, and a 'Massage' option that relieves tenderness and teething pain with its gentle vibrations. Lightweight and ergonomic for a non-slip, comfortable grip, the electric toothbrush has been crafted from bacteria-resistant, food-grade silicone for ultimate hygiene, whilst its encased one-piece design has no detachable parts or sharp edges for superior safety. An integrated timer indicates when it is time to move to a different section of the mouth, and rewarding Smile Helpers ('Glee' and 'Glum') light up to track brushing time; encouraging even the youngest users to develop good dental care habits. Waterproof and dishwasher-safe for easy cleaning. Non-toxic. BPA and phthalate free.